It seems that in a galaxy far, far away - i.e. Los Angeles and Florida - we'll soon be able to experience the magical universe of Star Wars first hand IRL. 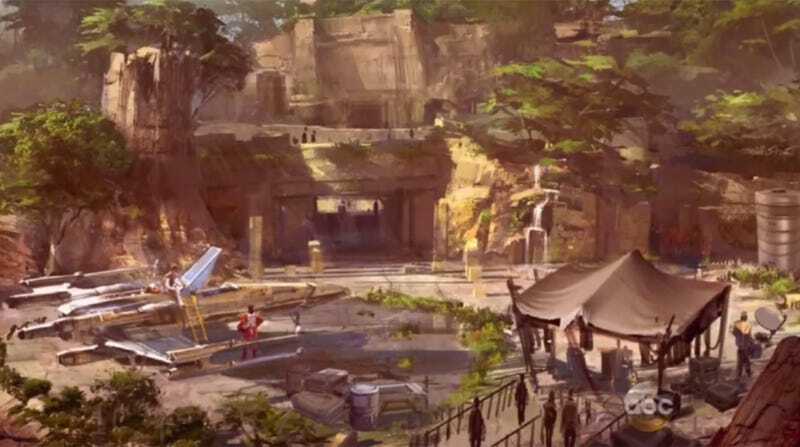 Originally announced last summer, Disney stated that they were expanding their theme parks, with new Star Wars-themed rides and attractions and basically everyone lost their minds. Now, during a TV special celebrating 60 years of Disneyland, Han Solo himself revealed new concept art and a rather jazzy video that details all the galactic excitement. According to the clip, the new expansion will give visitors the chance to truly experience what it's like to fly the Millennium Falcon (including it's laser canons! ), you'll get caught up in a battle and there'll be a cantina for those daring enough to head to the underbelly of Coruscant. Basically, we'll be able to finally live that Star Wars life. We just hope there'll be tiny BB-8s and R2s roaming around for us to cuddle and play with. And that we don't end up canon fodder for some bounty hunter. Watch the TV spot for the Star Wars Experience below.